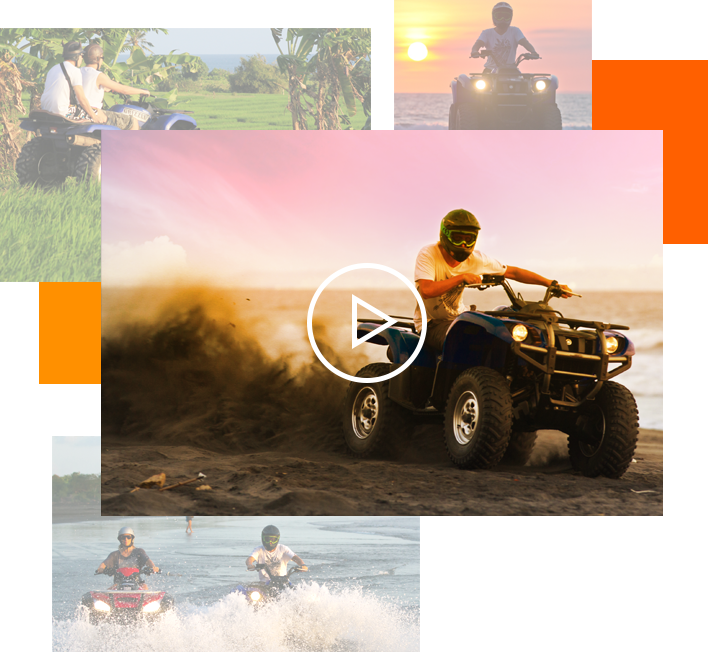 ATV Bali Tour Specialist. Book Now! 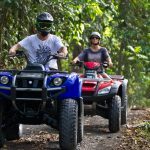 Bali Island ATV is the leading ATV Bali tour operator.. 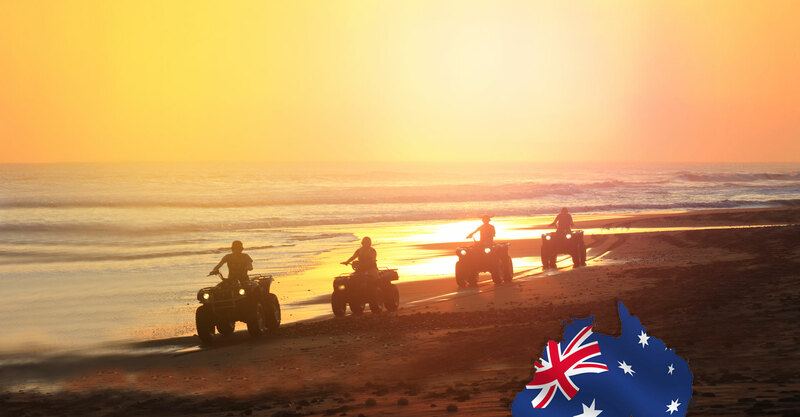 Operational since 1996, is the number 1 provider of Bali quad biking tours. 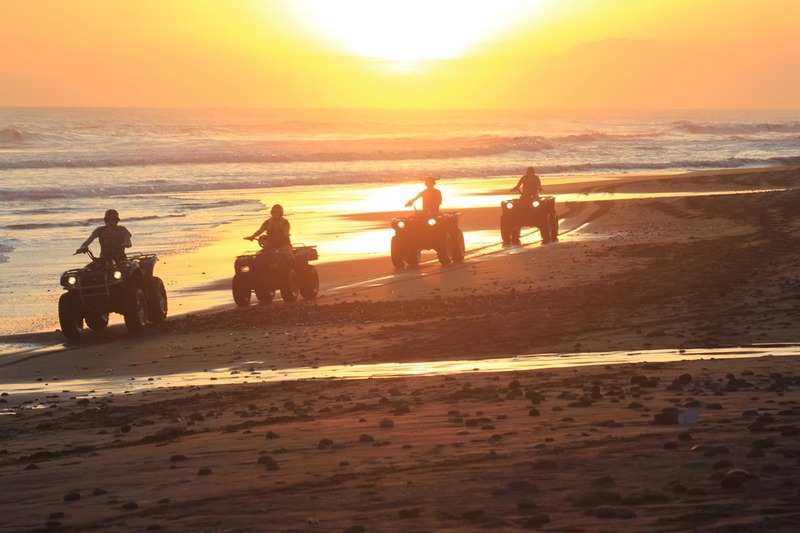 Based on the stunning Yeh Gangga beach, we are your trusted experts for unbeatable ATV Tours in Bali. 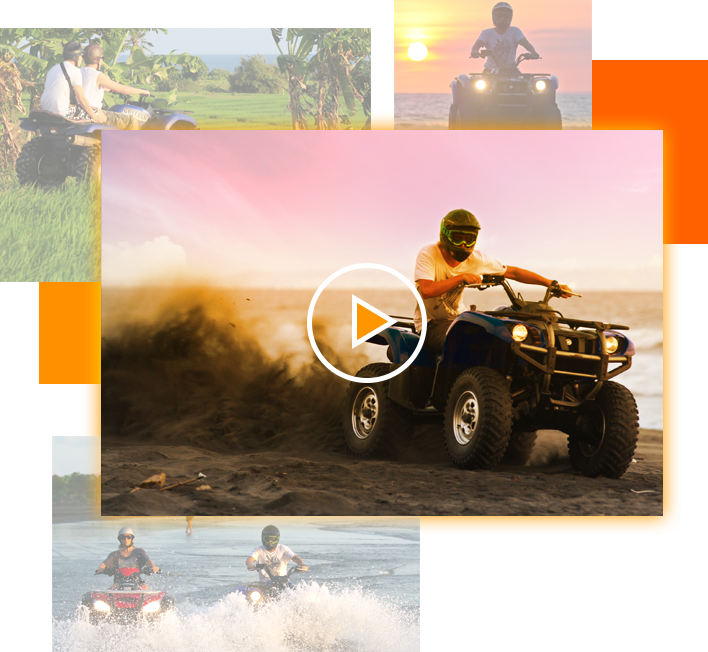 Offering 1 or 2 hour tours, you’ll get the experience the exhilaration of riding a high powered quad bike along the sands, as the surf crashes behind you, the tranquillity of the rice fields and pass sacred temples and welcoming smiles in local villages. We pride ourselves on quality: the quality of service we provide to our guests and the quality of our equipment. Our guides all speak English fluently and are knowledgeable about the local area. Our mechanics are trained by international engineers and our bikes are also regularly serviced by visiting international mechanics to ensure that they are in top shape and always reliable. 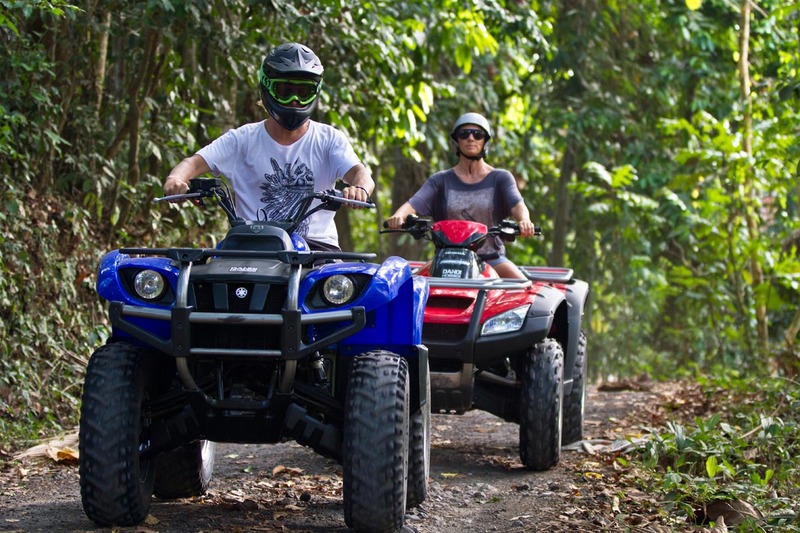 What’s more, we’ve got the biggest bikes on the island ranging from 350 – 500 CC. 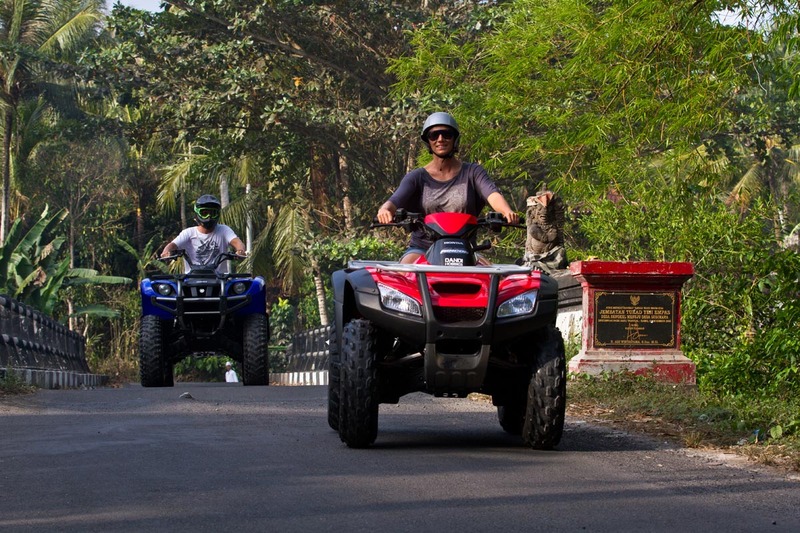 With plenty of power, they’re fully automatic and easy to ride guaranteeing a great day out for everyone! 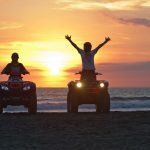 Yeh Gangga provides a fantastic location for quad biking Bali. 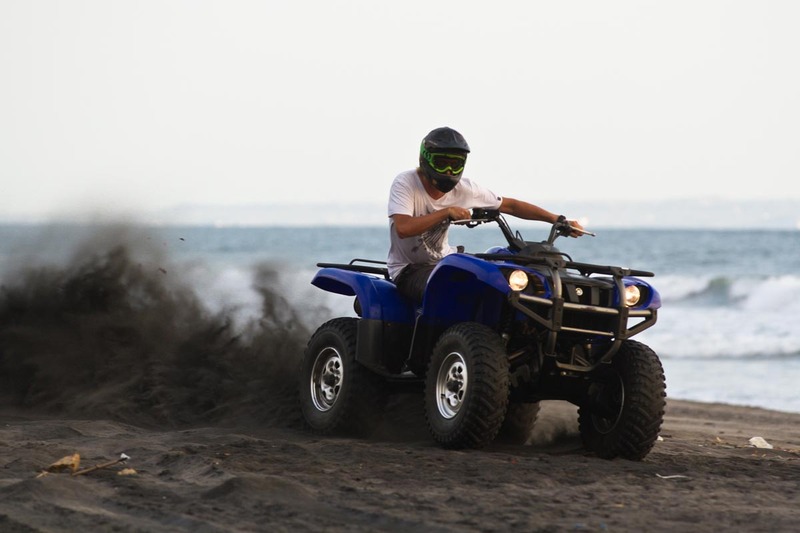 Just a short journey from the major tourist centre of Seminyak, this quiet village offers visitors an enviable opportunity to view a different side of Bali and Balinese culture, combined with the thrills and excitement of a Bali ATV tour. 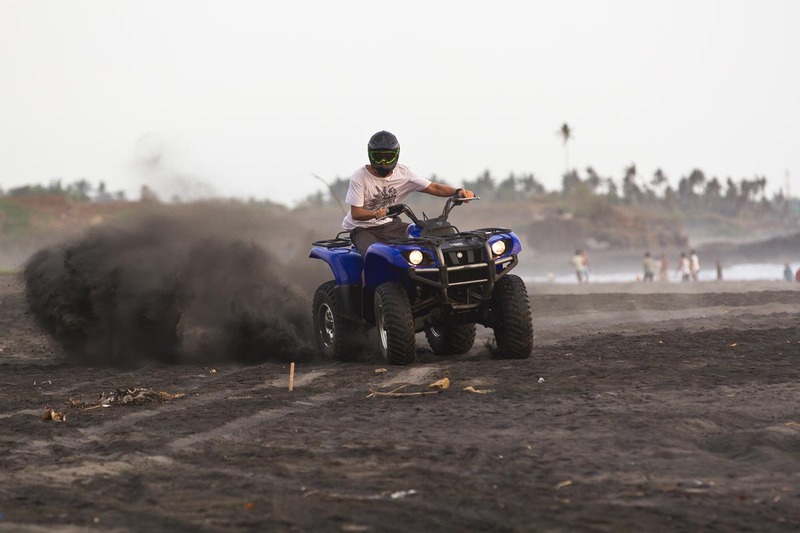 The black sands of the beach – black due to the colour of the volcanic rock from which they are formed – lay virtually deserted for miles apart from the occasional local fisherman, or surfer enjoying uncrowded waves. The views are stunning, and on clear days you may even be able to see as far west as Medewi, some 50km distant. 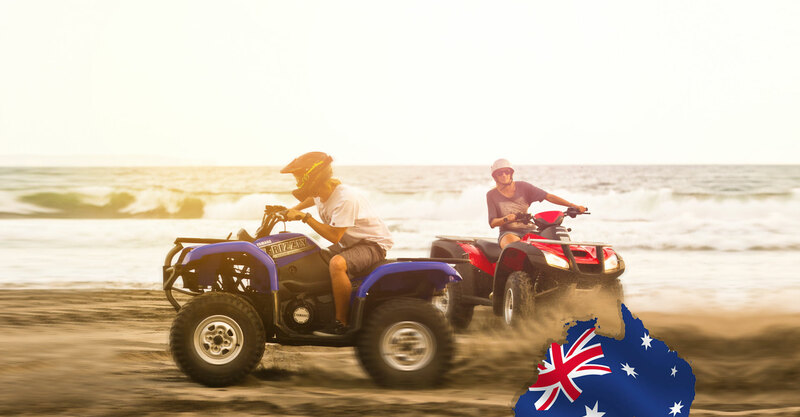 As you soak it all up on your Bali quad bike tour, there’s no doubt that you’ll feel very much as though you are experiencing the real Bali. Ceremonies form a central part of the culture here and you may well find yourself witnessing a ceremonial procession through a village or down to the sea. The white ceremonial dress of the Balinese contrasting against the dark sands and green rice paddies, accompanied by the sounds of the gamelan – the traditional music of Bali. 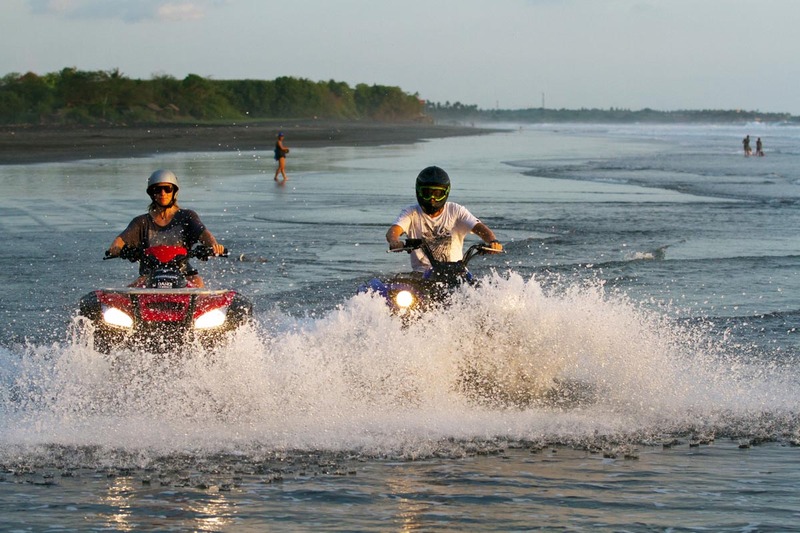 After riding along the beach, and speeding through the fresh water streams, your guides will lead you inland. Here take time to experience a traditional village, largely unaffected by tourism. Local shops and eateries, known as ‘warungs’ line the road side and you’ll be sure of a warm smile and friendly wave from people as you pass. There’s a tranquillity to life in the villages, so while speed on the bikes is great fun, take the time here to slow down and take in your surroundings. Listen carefully and it’s likely you’ll hear the gentle sounds of the gamelan not far off. 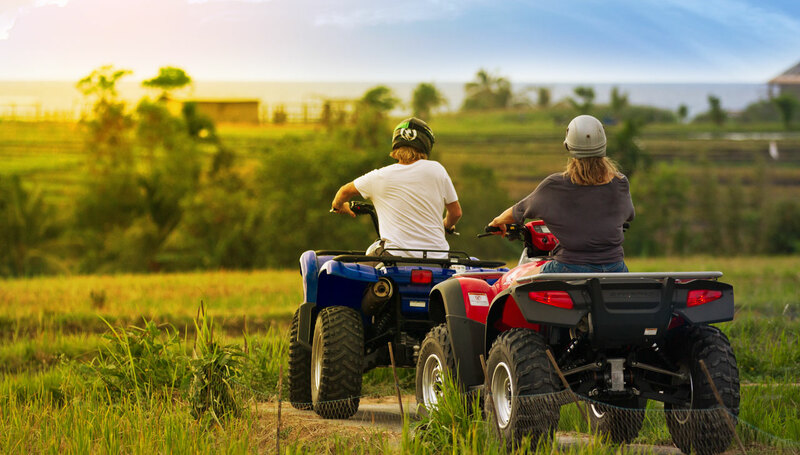 As you leave the village, your Bali quad bike tour will take you to the rural landscape of the rice fields. Rice is the staple food in Bali, like so many countries in South East Asia, and the farming methods have changed little over the centuries. As you ride through the trails between the fields, feel the gentle breezes through the air as the farmers, with traditional conical hats to protect them from the sun’s hot rays bend to lovingly tend to their crops. 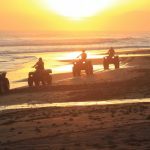 As your ATV Bali tour leaves the rice paddies, you’ll find yourself on a cliff top which provides further stunning views of the south Bali coast. As you finally head back, there’s one final treat in store, a bat cave on the beach! 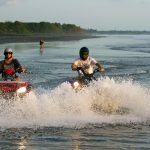 Experiencing and ATV tour in Bali is an experience never to be forgotten – and if something’s worth doing, it’s worth doing properly, so don’t trust anyone but the experts, Bali Island ATV to provide you with the best possible experience. With our two hour tours, transfers to and from your hotel are included. Full insurance is included in the price and you’ll end your tour with a BBQ Sausage Sizzle! Because of our commitment to quality, you won’t get better on the island. We have the best bikes, the best staff, and when you join us we’ll have the very best customers too. 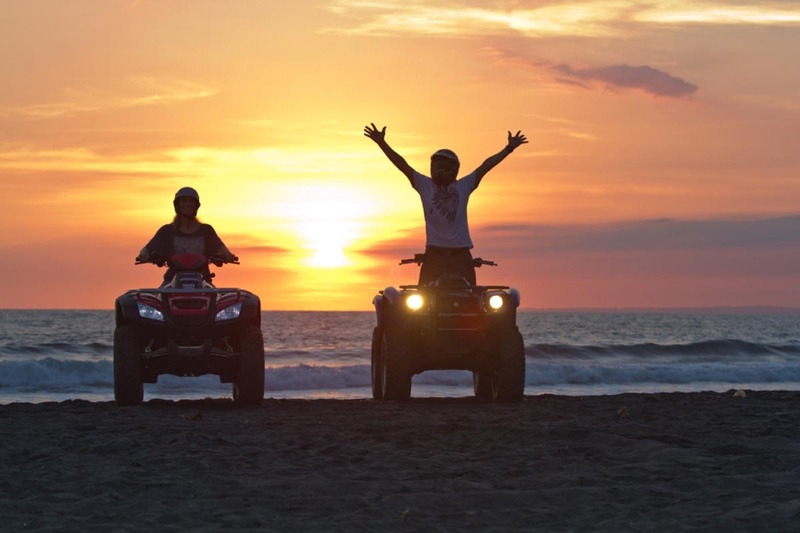 Bali Quad biking doesn’t get any better than this! Explore Bali’s natural beauty. 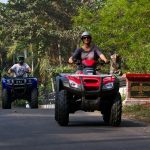 Enjoy the thrill of an ATV Quad Bike tour through Yeh Gangga visiting beaches, rice fields, local villages and stunning cliff tops. 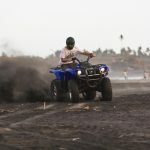 Riding ATV Quad Bikes is great fun, and Yeh Gangga is the best location on the island with beaches, rice paddies, local villages and stunning views. Don’t just take our word for it though, check out the gallery with some awesome pictures of our tours! 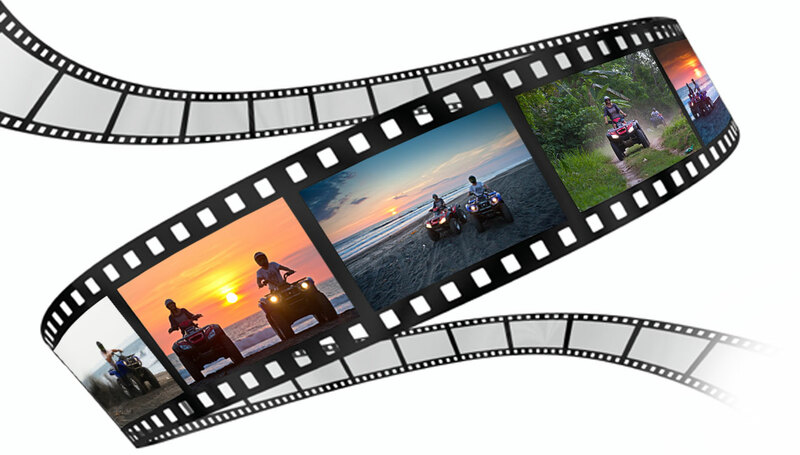 There’s only one way to really find out how great Bali ATV tours are - experience one for yourself! In the meantime time though, check out this great video which will give you just a teaser of what’s waiting for you. 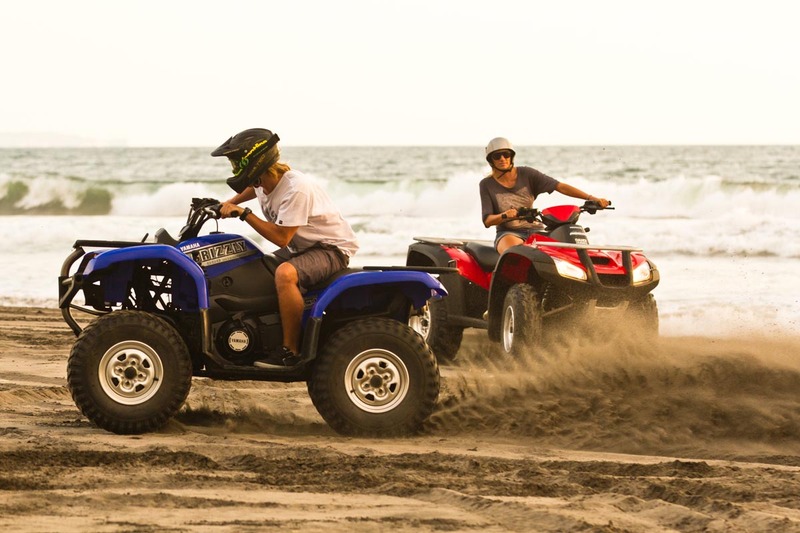 How long is the drive from Kuta / Legian to the ATV Location? How long is the drive from Nusa Dua to the ATV Location? At what age can children ride solo? In general, children from 14 years of age can ride solo. However the child will be assessed on arrival for capability to drive solo for safety reasons. 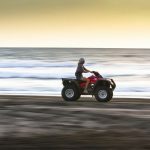 If we are unsure we will offer for one of our guides to ride on the back of the ATV as Co-Pilot so they are there for back up if needed. What pick up times do you offer? We have 3 designated pick up times however we will inform you the best times on the day you have chosen based on low tide so you can get maximum beach time. Please note the tides in Bali change frequently so just ask us for more details. If it is raining, does this affect the tour? Our tours still operate in the rain and we provide rain coats. Please make sure you bring a change of clothes and towel to our location. What is the minimum age a child can join as tandem with a parent? We have no age restrictions for children joining for a tandem tour with a parent. However please note our insurance policy covers from 7 years of age and older. We do have lots of younger children join the tour. What do you provide with the tour? We will provide you with a helmet and chaps for your legs. We also provide a BBQ sausage sizzle and soft drink with all 2 Hour Tours. For vegetarians we can offer vegetarian Nasi Goreng. Any footwear is fine, the bikes are fully automatic and easy to operate. Yes we can cater for a requested private tour, please message us for more details. Are pick up and return transfers included? For all 2 hour tours the pick up and return transfers are included in the price. For the 1hr tour the pick up and return transfers are additional. Do you have a photography service? Yes we do have a photography service and it is optional if you would like to purchase the photos after the activity. 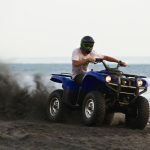 Are the ATV’s safe for beginners? 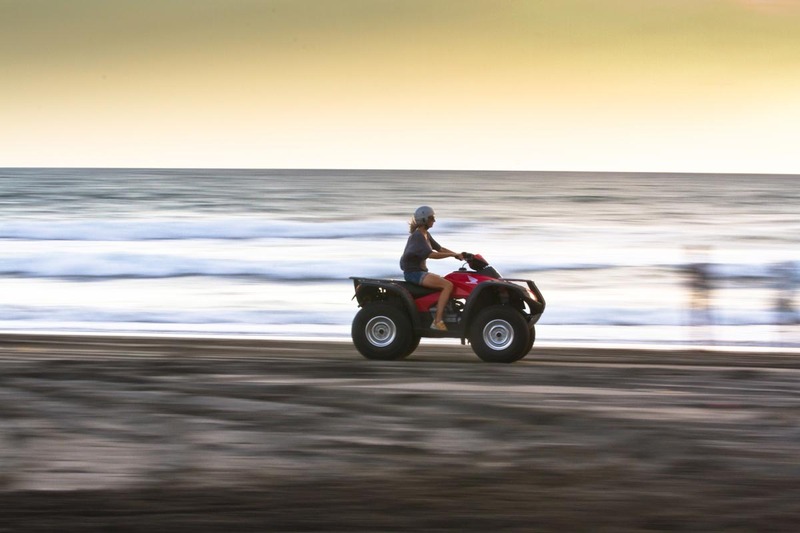 Yes most beginners can easily operate the ATV’s as they are fully automatic. You will be given instructions before you commence the tour and our friendly guides are always there to assist you during the tour if you should need any help. What area is the ATV Tour? Please bring your camera, a towel and a change of clothes. Bring some extra cash with you for purchase of drinks or souvenirs if you would like to. It is much better to book in advance to make sure you get your preferred timeslot and date. We accept cash only at the location, if you would prefer we are happy to send you a PayPal request so that you can pay by card in advance. Australian owned and operated, since 1996 with experienced English speaking Guides. Full insurance provided. Internationally trained mechanics ensure that our bikes are in top condition, every time. 500CC – 700CC Bikes. The biggest on the island, fully automatic and easy to ride. Stunning location allowing you to ride on the beach, through rice fields, past sacred temples and local villages.